Filter (IAutoCompleteFilter): Defines the function that will be used to filter items. item: The item to be checked. searchText: The current text in the RadAutoCompleteView control. completionMode: The current CompletionMode of RadAutoCompleteView. The function returns true when the item is added into RadAutoCompleteView FilteredItems collection, otherwise it returns false and the item won't be added into RadAutoCompleteView FilteredItems collection. The RadAutoCompleteView TextSearchPath property is required in custom filtering scenarios. 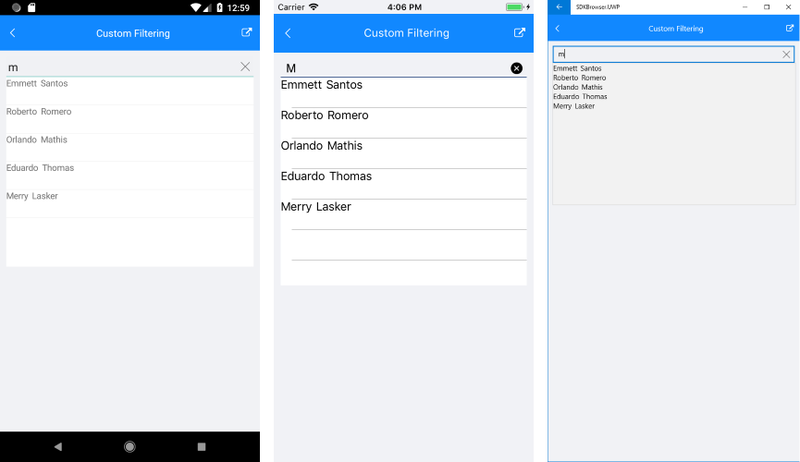 A sample Custom Filtering example can be found in the AutoCompleteView/Features folder of the SDK Samples Browser application.